I’ve got some spare time this afternoon, and am in the mood for a bit of blogging; except that I’m feeling too lazy to go to all the bother of constructing a proper post. So instead of that, ask me some questions in the comments box. Every question I get for the next hour and a half WILL be answered. By the way, I’m still one judge short for Post Of The Week. 1. When is the next podcast coming out? Good question. I’ve been meaning to record another podcast for many weeks, but am forever procrastinating. This week would have been ideal, as I was home alone while K was at a conference in Florida, but sadly the thought never occurred to me. Back to the podcast qusetion. I’ll try and get one recorded before the end of the month, OK? Erm, that’s a sort-of promise. 2. What is the best Christmas gift you received/gave? Best gift received: The tricycle which my parents gave me in 1966. To this day, it is the only vehicle which I have successfully mastered. Best gift given: I’m very pleased with my mother’s present this year: an amateur watercolour of Belfield House in Wyke Regis (on the outskirts of Weymouth), painted in 1907 by the niece of the occupants. This is the house which my mother grew up in, from the age of six to sixteen. 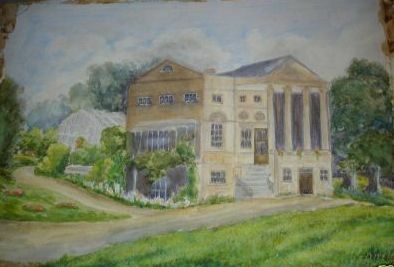 I have recently been transcribing her memories of life in Belfield House on her own blog – and while doing so, a speculative Google search took me to an active eBay auction for the painting. I’ll be picking it up from the picture-framers tomorrow. 3. If my husband and I were transferred to a city in England called Birmingham next year, would I be miserable? No, not at all. Birmingham gets far worse press than it deserves. Brummies are a largely friendly bunch, with a delightfully dry, laconic wit, and the city is culturally rich in just about every way. It may not be the most beautiful city in the world, but the city centre is much improved, and there’s an essential warmth to the place which the last fifty years of crap town planning has failed to extinguish. Oh, and it’s handy for the countryside as well. Oh dear. This might surprise some of you, but I don’t actually subscribe to any podcasts. (No, not even the Ricky Gervais/Guardian podcasts, as I didn’t think much of the first one.) The reason is that I already consume an abnormally large amount of new music, and there aren’t enough spare hours in my listening day to take a punt on someone else’s taste. However, if someone else would like to suggest some good podcasts, then please do so. Hypothetically speaking, if someone slapped you in the face and generally intimidated you during the course of a drunken argument but then couldn’t remember it in the morning – should you never speak to that person again, or would you forgive and forget? Neither. I would raise the issue with them within the next couple of days, calmly and clearly explaining what they had said/done, and how it made me feel. If suitably sincere apologies were forthcoming, then forgiveness could ensue. As for the forgetting: I’ve got too retentive a memory for that ever to be much of a possibility, but the forgiveness would do a good job of keeping a lid on the memory. If the apology was not sincere, or over-qualified with dubious self-justifications, or turned back against me as somehow being my fault, then I would have to consider my position further. The same would hold true if the slapping/intimidation had become habitual. There’s also the question of how much the drunken behaviour either magnified or masked the true character beneath. When I get drunk, I do still stay recognisably in character, even if some elements might become magnified at the expense of others. However, I do know of a few people who undergo complete Jeckyll & Hyde personality changes after their alcoholic consumption has passed a certain limit, and that can be even scarier for them than it can for me. My reaction to drunken bad behaviour can therefore vary considerably according to the personality involved. Yikes, and I’m flat out of time. That was fun. Thanks to those who asked. Previous Previous post: An asterisk is no defence. Next Next post: Post of the Week: Week 7 results, Week 8 nominations.